Release originally appeard on Yahoo! Movies. In keeping with the theme of the iab's Digital Content NewFronts 2016 focus of presenting innovative programming strategies, one of the industry's most forward-thinking over-the-top (OTT) platforms is announcing its 10 latest channels at the conference. XUMO, the premier live and video-on-demand OTT service for the digital age, is adding Reuters, PBS Digital Studios, Mashable,Network A, The Onion, Fandor, Outside Television Shorts, Bonnier brands Field & Stream, Saveur, and Cycle World. This is XUMO's first foray into partnering with a premium, long-form content provider like Fandor. The partnership with Outside Television will serve as XUMO's first partnership with a cable network focused on short-form content. XUMO will continue to deliver content from top tier digital and video-first partners as part of the company's ongoing mission to provide quality content that meets audience's viewing preferences -- for free. "With a diverse and growing audience, it's important that XUMO delivers the industry's most compelling content from leading channel partners. That said, we're pleased to add new channels from Reuters, Outside Television, and Mashable to our ever-growing roster," said Colin Petrie-Norris, CEO of XUMO. "Forget tangled cords and boxes. With XUMO, we've eliminated the need for additional inputs and devices. 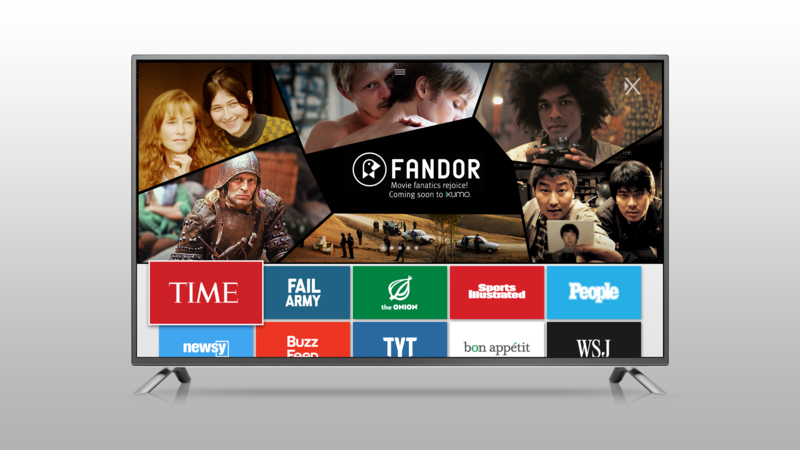 Viewers will be able to stream close to 80 free channels on approaching 60 percent of smart TVs shipped in the US." At NewFronts on May 5, XUMO will introduce 10 new channels and demo its new TV application user interface to attendees and press with LG Electronics' new Channel Plus feature, exclusively powered by XUMO. Channel Plus will begin delivering free access to XUMO's extensive roster of premier Internet and broadcast channels on 2016 LG Smart TVs with webOS in the U.S. this summer. To book media demo walk-throughs, contact davidf@lfpr.com. XUMO's distribution and reach is approaching 20 million devices in the US and, in addition to LG, is available on new smart TVs from VIZIO, Panasonic and Funai Electric Co., Ltd. who manufactures and sells Sanyo, Magnavox and Philips in North America. The addition of these channels to XUMO's growing content catalogue demonstrates the company's commitment to increasing the breadth of the platform's channels while simultaneously securing broad distribution and reach. To learn more about how XUMO delivers premium content from providers like PBS Digital Studios, Mashable and Saveur, or to learn how to become a partner, please visit http://www.xumo.com/.